procedure when the engine is cool. 1. Turn the fuel valve off. 3. 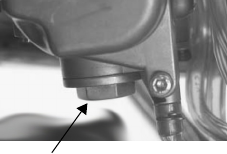 Remove the hex plug (1). Allow fluids to drain. 4. Reinstall the hex plug securely.